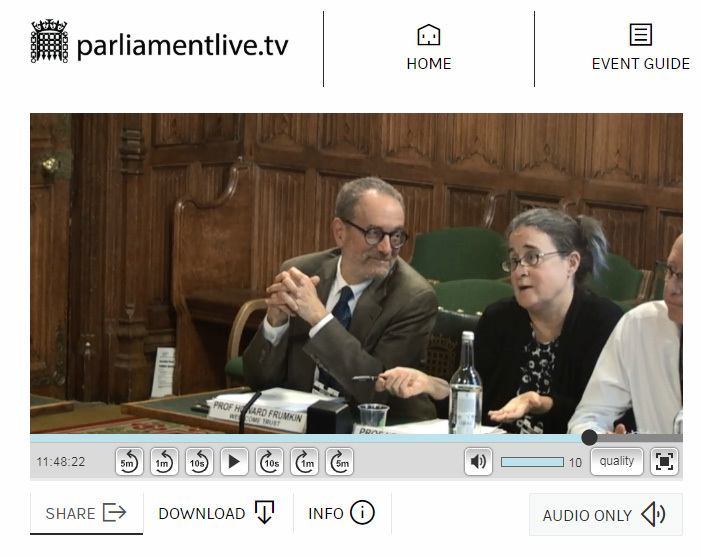 Oceans and human health research is beginning to make waves in policy circles, and last week Professor Lora Fleming presented evidence to a panel at the UK’s Parliament. Lora was speaking as part of a ‘Planetary Health’ inquiry, hosted by the Environmental Audit Committee, to explore the implications of global environmental change on human health. The panel was chaired by Mary Creagh MP, and Lora was joined by Professor Sir Andy Haines from the London School of Hygiene and Tropical Medicine, and Professor Howard Frumkin from the Wellcome Trust. Whilst a range of topics were tabled throughout the session including food, urbanisation, air pollution, data, and governance, the panellists were first asked to introduce the concept of Planetary Health. They discussed how environmental change can exacerbate heat stresses and disease, and how biodiversity loss can affect food production. Drawing attention to the potential for a Planetary Health framework to offer and assess synergistic benefits, Lora used the example of how urban gardening can be positive for both food production and mental health; and cited evidence suggesting that interacting with the natural environment can influence pro-environmental behaviour – especially for children. Lora discusses oceans and human health research. She also described behavioural data that suggests praising and rewarding good behaviour – rather than naming and shaming bad behaviour – could be applied to large companies. The pan-European projects BlueHealth and SOPHIE were both highlighted as “fascinating” by Kerry McCarthy, one of the attending parliamentary members, and Lora highlighted the GCRF-funded Blue Communities project too. The panel discussed how a Planetary Health perspective allows people from a broad array of disciplines to think differently about the grand challenges we face in the 21st Century, and how it can be used for both monitoring and accountability. Lora consistently highlighted the human health benefits of interacting with natural environments, and the importance of sharing data and knowledge. All the panelists agreed on the need for more research funding focused on the links between global environmental change and human health, also suggesting it should be taught in professional degrees including medicine and nursing. We caught up with Lora when she returned to Cornwall, “It was amazing that – despite everything that’s happening in politics at the moment – a dedicated group of MPs took the time to think about the future of our planet’s health and the impact this could have on our own health. “They had clearly done their homework and cared about the subjects we were discussing, which gives me hope for the future of this research area, and presents the genuine possibility that we might be able to work together to create real change” she said. An overview of the panel’s discussion will be available as an audio podcast here shortly.